"I don't think I could ever imagine a life without dance," says Britta Joy Peterson. 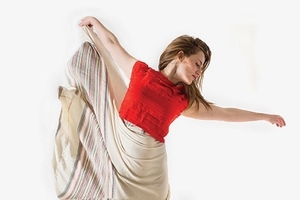 Peterson is the director of American University's Dance Program-and a dance artist who choreographs, performs, designs, and collaborates on contemporary dance works. Her dedication to her craft has helped pave the way for AU's first dance major, which makes its debut this year. With a focus on cultural inclusiveness and an interdisciplinary approach to engaging with dance, the degree gives students an opportunity to develop their physical skills and challenge traditional dance boundaries. Peterson and Department of Performing Arts Professorial Lecturer Erin Foreman-Murray designed the 43-credit major and its foundational curriculum. They focused on making the degree flexible for students, allowing for double majors, multiple minors, and participation in extracurricular activities and internships. "I have learned a lot about what it means to be an Eagle while working with my students," Peterson says. "They are eager to learn, incredibly rigorous with themselves, and committed to doing their best work. These students are open to new ideas, to making connections, and to finding intersections between fields and forms academic disciplines." The degree takes an interdisciplinary approach, requiring students to learn multiple skills by enrolling in design, media, technology, business, and management classes. Through this series, aptly titled "Studies in Innovation," students can take classes like "Intro to Computer Science" and "Nonprofit Entrepreneurship" and explore fields that complement their dance studies. "We think of the student in the driver's seat because they are in control of what they want to do," Peterson explained. "And that goes back to the fact that AU students are opinionated, smart, and have all these ideas about how they want to change the world-we're here to help them figure out how to make those ideas happen." According to Peterson, the new major is grounded in cultural inclusiveness. Most dance degrees tend to prioritize Western dance forms by requiring more credits of ballet or modern than other forms. But Peterson says that all dance forms are considered equally valuable in AU's Dance Program, including urban forms like waacking and popping, and somatic forms like yoga and tai chi. Peterson also hopes to create a larger and more inclusive community by welcoming any student who wishes to pursue dance. "I believe that every AU student should take a class from us," Peterson says. "Another big goal for the dance program is to become a greater presence in the DC metro dance community. I want to perform more, grow our audience, and bring our work into new areas of the community."